This Thanksgiving we have much to be grateful for, particularly a new president who, in addition to being our first African American, is articulate, calm and inclusive. Hopefully he can change the tone and direction of US politics and bring about a more peaceful world. Unfortunately our current economy is not one of the things we are going to be giving thanks for. Like other businesses, sales have fallen off for Arte Maya. I am hoping that sales of the calendar will pick up so that I can at least break even. Each year I spend more than a month full time designing, producing and distributing the calendar. While I don't mind donating this time, my hope is that sales of the calendar will at least contribute something financially for the artists. The 2009 Arte Maya calendar is in both English and Spanish. 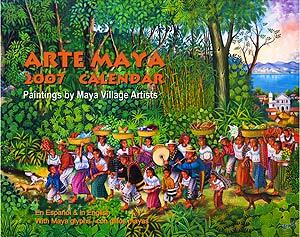 The calendar includes photographs and biographies of the twelve Maya artists whose paintings appear in the calendar. The calendar includes four women artists—two Tz'utuhil and two Kaqchikel women. The front cover is a detail of a painting by Margarito Chex Icú. While Margot Blum Schevill was curating "Traje de la Vida: The Maya Textiles of Guatemala," an exhibition for the Phoebe Hearst Museum of Anthropology which opened in September, she asked me if there was an ancient image of the Maya calendar that they could use. There is a famous stone showing the Aztec calendar, but there is no similar artifact for the Maya calendar. The Maya calendar is generally depicted at three rotating wheels that interlock, but this is a modern depiction of how the Maya calendar works. 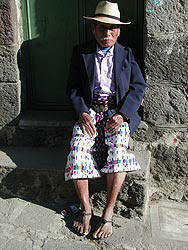 Last week I attended a lecture at San Francisco City College by Alonso Mendez a Tzeltal Maya Archeoastronomer. 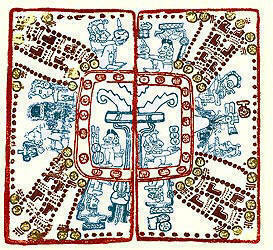 During the presentation he showed an image (left) from the Madrid Codex that depicted the tzolkin, the 260 day Maya ceremonial calendar. I found the Madrid Codex on-line and copied the images of the two pages that made up the Maya calendar. Then, in order to see more clearly what was represented, I cleaned up the black and white image eliminating any marks that were part of the paper, and then grouped similar elements by coloring them differently. The brown dots which go around the edge of the calendar (and in and out at the corners) represent the days. There are 260 of them. The Maya gods are in blue. The twenty day glyphs are in the red border to the central drawing. 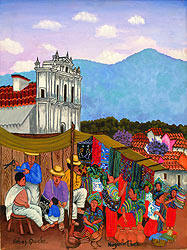 San Juan Comalapa artist Margarito Chex has been painting for many years. In 1988, two of the first Maya paintings I bought were by Margarito Chex. I bought them in a gallery in Guatemala City, El Tunel, but it wasn't until last year that I finally met Margarito while visiting Paula Nicho Cumes in Comalapa. 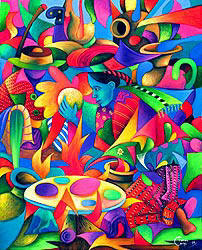 His painting style is very different from that of the Tz'utuhil Maya artists around Lake Atitlan. 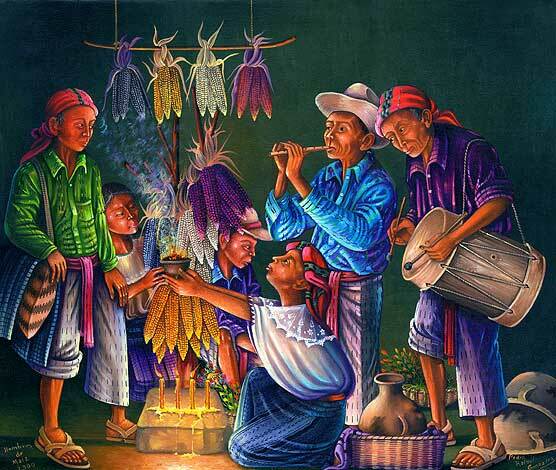 It is very Guatemalan, very colorful, and comes out of the Maya culture of his town, and the style of its first painter Andres Curruchich. Juana Elva Vasquez is from San Pedro la Laguna and her husband Nicolas Ramez is from Santiago Atitlán. Together they run a gallery in Santiago on the street from the dock to the center of town. Hundreds of tourists pass by their gallery every day. The oil paintings in their gallery, done by Nicolas and a number of other artists, are typical of the fare offered for sale cheaply to tourists—not very good. Hidden among these oil paintings are Nicolas and Elva's little watercolors painted on stiff paper. The style of these paintings is different from any other Maya artist. 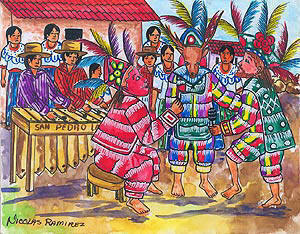 The color and energy of these watercolors captures the spirit of the festivals and masked dances of the Maya. Julian Coche Mendoza was a talented teenage artist in the Tz'utuhil Maya style of painting before his family sent him to art school in Guatemala City. After graduating, he lost his way as an artist. His paintings were a conglomerate of styles, nothing as good as what he had done before he went away to school. Finally after about ten years, he came up with this style of painting—a sort of amorphous cubism. The painting at left is of a woman making tortillas. Other Maya artists have started copying Julian's style. I am pleased he has found a direction again for his paintings, and so to encourage him, I bought several even though they are not in the styles I normally purchase. I will be interested in seeing if they appeal to others. Madrid Codex at the FAMSI (Foundation for the Advancement of Mesoamerican Studies, Inc.). The Maya calendar is on pages 75 and 76.